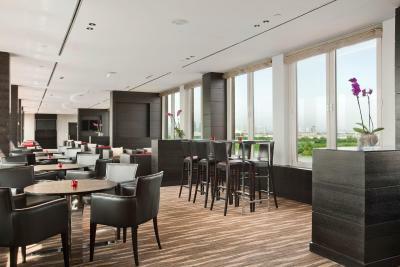 Lock in a great price for Hilton Vienna Danube Waterfront – rated 8.3 by recent guests! Even though it's not in the city centre it is well connected, the subway station being only 5 minutes away. I loved the Danube view and the windows which could be opened. The standard room was spacious and had a nice variety of TV channels as well as a tea kettle. Breakfast was great, as well as the steak for dinner at the hotel restaurant. View from 6th floor was amazing. The hotel is not very close to the city centre but the transport system in Vienna is excellent so that is not a major problem. 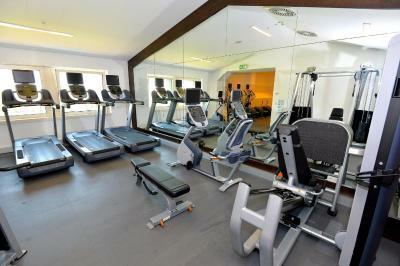 The hotel is large and comfortable with a nice position on the banks of the Danube. Some of the rooms are very large and spacious. Good value. Cleanliness, confort, interesting location were very nice. The staff was friendly and honest, specially the room service. Hilton Vienna Danube Waterfront This rating is a reflection of how the property compares to the industry standard when it comes to price, facilities and services available. It's based on a self-evaluation by the property. Use this rating to help choose your stay! 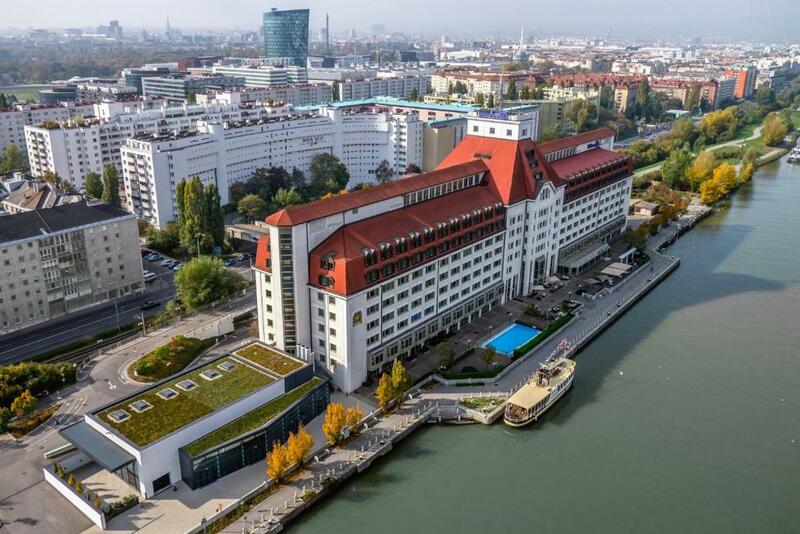 One of our top picks in Vienna.Located directly on the banks of the Danube River, the 4-star superior Hilton Vienna Danube Waterfront is only 7 minutes by underground from the city center. It offers an open-air riverside pool and free WiFi in public areas. 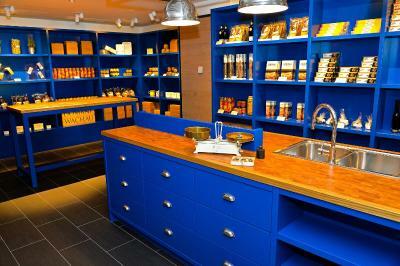 The Waterfront Kitchen offers dishes made from fresh seasonal ingredients from Austria and Northern Italy. In summer, guests can enjoy views of the Danube from the spacious terrace. The Pier 269 Bar & Lounge serves a wide range of cocktails, drinks and snacks. An internet terminal with a printer is provided in the hotel lobby free of charge. 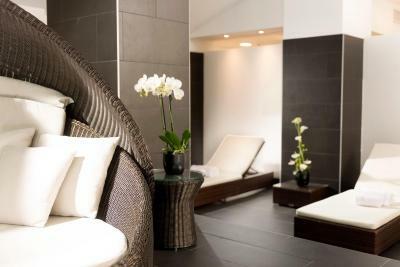 Guests can relax in the Hilton Vienna Danube Waterfront's sauna, hot tub, and gym. Massages are available on request. A volleyball court is also on site. Guests in Executive rooms and suites can enjoy exclusive access to the Executive Lounge with complimentary breakfast, international newspapers and refreshments throughout the day and benefit from an express check-in and check-out counter. The Stadion Underground Station (line U2) is only a 7-minute walk away. 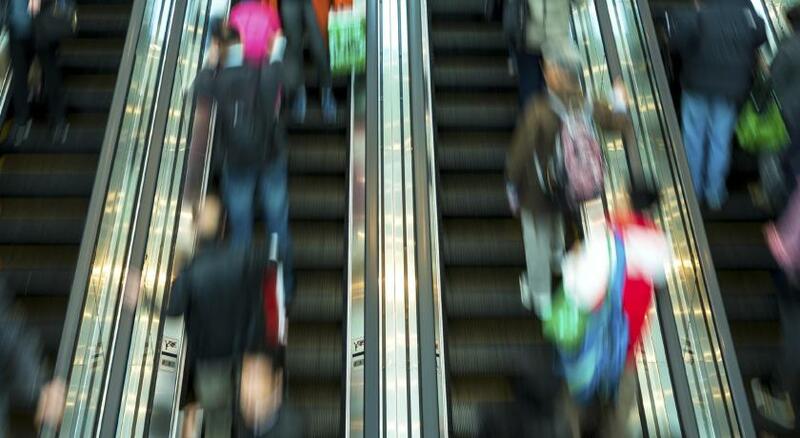 The airport bus stops at a location a 5-minute walk away. Vienna’s exhibition center (Messe Wien) and the famous Prater amusement park with the Ferris wheel are also only a short walk away. Jogging and bicycle paths along the Danube start right outside the hotel. The Krieau driving range and golf course is 0.6 mi away. 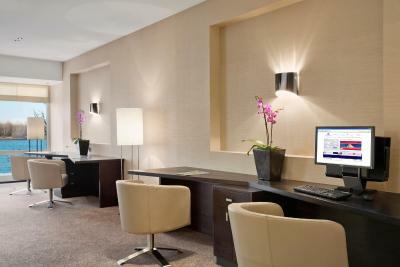 When would you like to stay at Hilton Vienna Danube Waterfront? Spacious and luxurious suite with large floor-to-ceiling windows to enjoy spectacular views of the River Danube. It comes with 37-inch LCD TV, a bathrobe, slippers, magazines and newspapers. Guests enjoy separate sleeping, working and seating areas as well as a complimentary access to the Executive Lounge with free breakfast and refreshments throughout the day and benefit from an express check-in and check-out counter. Spacious guest room with city view and separate sitting and working areas. Upgrade to an Executive Room on the higher floors to get access to the Executive Lounge with complimentary breakfast and refreshments and to enjoy beautiful views of the city skyline and a separate comfortable sitting area. Upgrade to a Deluxe Double Room to enjoy large panorama windows and fantastic views of the Danube River as well as separate sitting and working areas. This room offers views of the Danube River from the large windows and comes with separate sitting and working areas. Catch up on work at the large desk, keep in touch with wireless internet access or unwind and watch a movie on the 37-inch HD-LCD TV. This comfortable room offers city view and has a separate sitting and working areas. The spacious room, in rich, warm tones, has 2 queen beds and large windows. Catch up on work at the desk or surf the web with wireless internet access. Catch up on work in the separate working area or unwind in the seating area and watch a movie on the 46-inch HD-LCD TV. 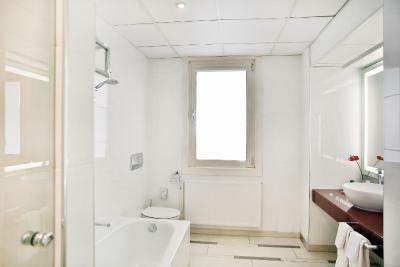 It offers views of the city and includes a bathrobe and slippers. Guests enjoy a complimentary access to the Executive Lounge with free breakfast and refreshments throughout the day and benefit from an express check-in and check-out counter. 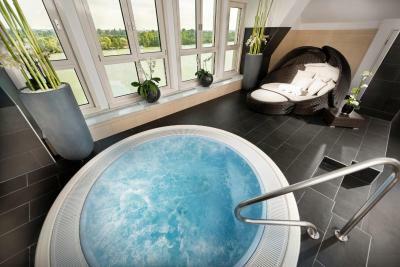 Relax in style in a modern room, located on a high floor offering impressive city views. The spacious room has large windows and separate seating and working areas. Catch up on work at the large desk, check your emails with wireless internet access or relax and watch a movie on the 37-inch HD-LCD flat screen TV. 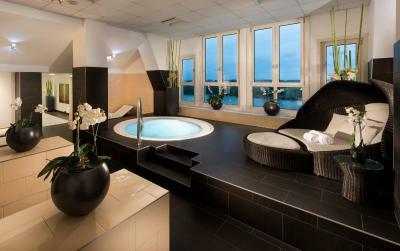 Relax in style in a modern room, located on a high floor offering impressive Danube river views. The spacious room has large windows and separate seating and working areas. Catch up on work at the large desk, check your emails with wireless internet access or relax and watch a movie on the 37-inch HD-LCD flat screen TV. This comfortable room has views of the Danube River and a separate working area. The spacious room has rich, warm tones, 2 queen beds and large windows. Catch up on work at the desk or surf the web with wireless internet access. This luxurious suite offers views of the Danube River. Catch up on work in the separate working area or unwind in the seating area and watch a movie on the 46-inch HD-LCD TV. It comes with a bathrobe and slippers. This family room features a tea/coffee maker, dining area and electric kettle. This suite has air conditioning, tea/coffee maker and soundproofing. 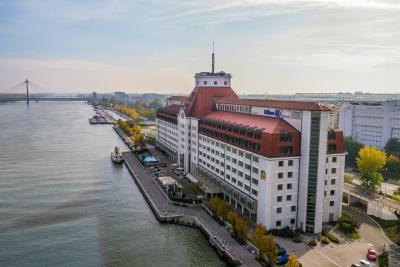 Hilton Vienna Danube Waterfront is the only hotel in the city that is located on the banks of the Danube river. It is a perfect location to truly enjoy summer in Vienna and still easily access city center. During summer Viennese move their every day life activities to this special river and use it for recreation, games and sports or for pleasurable hours on the Old Danube, as well as Copa Cagrana and Sunken City on Danube Island. House Rules Hilton Vienna Danube Waterfront takes special requests – add in the next step! Hilton Vienna Danube Waterfront accepts these cards and reserves the right to temporarily hold an amount prior to arrival. Food and drinks in the bar are over priced. Late check out an extra €30. Perfect location just walking distance from metro and shopping centre. Lovely breakfast. Very friendly staff. The rooms were very warm and the A/C wasn’t very effective, we had to have the window open all night and our room overlooked a road and railway line. There were a couple of broken plug sockets and lightbulbs in the room but nothing that would ruin our stay. Breakfast and car parking are very expensive. The beds are comfortable, service is excellent and the club sandwiches are amazing. I thought the mattress topper was very uncomfortable but once I removed it it was ok.
Nice location by the river. Very goog breakfast. WiFi started to ask for payment. Cappuccino at the bar was 4.50. Fitness center was a small room. Sauna kind of like a home sauna. Whirlpool/hotpool looked pretty nice, but was a kind of massage lady or attendant in there with an old guy creeping on her (or something?). I felt awkward and didn't want to use it. Great breakfast, but apparently all window seats reserved for Hilton Honors members. Great location for access to Ubahn. It's a very nice hotel overall. Very helpful & professional staff at front desk, restaurant, and bar.